Boyce Avenue with Moira - Touring the Philippines ~ Mommy Meowmeow! I feel like so many things happened today - shuffling between wifey / mommy modes, talking to friends, job offers which I can't take right now (not a humble brag but I was surprised myself. yes plural, sometimes they just come at the same time) and Zumba in the evening...the highlight is definitely meeting BOYCE AVENUE in the flesh! I have to thank my friend the beautiful and very talented Kathy Choy - Ranoa for inviting me to this event. It was quite funny how just a couple of weeks ago I was looking for someone to join me to the concert. I invited her and said it's on a Friday but she said, "Madz, no I think it's on a Thursday." She checked her calendar and BOOM! Turns out she was indeed going to a Boyce Avenue event on a Thursday cause she's the one hosting it! Hahaha..iba ka girl! :) She asked permission if she can invite and luckily they agreed. Warm fuzzies all over!!! That..on top of the sweltering Manila heat! It's my first time to attend a press conference and even if I only brought my JVC digicam and Fujifilm mirrorless camera, (and there were monster cams and full set-ups) it doesn't matter at all. I was just savoring and taking in the experience. I'm a bit chatty here but in real life I can be a bit of a snob when I don't know anyone. Maybe the introvert side of me kicking into overdrive? Hahahaha.. So this is what happens pala at press conferences? The major networks went in first for their one-on-ones. Makes sense because they have to edit and air it in probably two hours or less. The rest of us came in for some Q&A's. I really wanted to ask a couple of questions but I just froze in my seat. Too starstruck and shy :) Don't worry, I'll post the video here as soon as it's uploaded in YouTube. I met new acquaintances by sitting and walking around. They are so nice! I count myself lucky if I can make fast friends or even just small talk with truly pleasant people. Okay, let's talk about Moira. She is such a doll! I honestly haven't followed all the reality shows and contests but I've been hearing about her. I was surprised that despite her major talent, she's still a bit flustered sitting next Boyce Avenue - one of her musical influences. You know if I was Moira, I'd be scared to death of being a wallflower at a press con like this. Especially if I'm next to Boyce Ave. But no, the press people have all been very gracious to her and she candidly answered questions and even gave out a very soulful "sample" as what most people would call it. You can tell that the Boyce Avenue guys are all very impressed with her too and they even said that if she tries, she can possibly be known internationally too! Well, what is YouTube for, right? 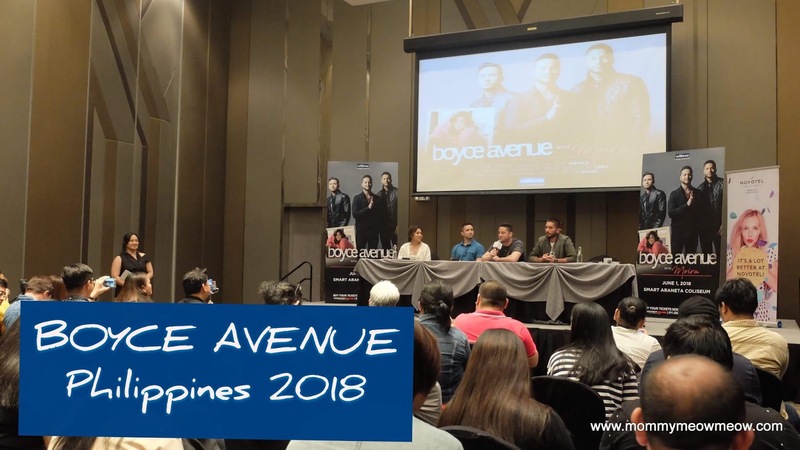 Let's talk about Boyce Avenue. Major major talent right here! You would think they'd just be good with sappy, sentimental love songs. But you know what? They are really able to stretch (in a good way) and reach other genres that are not usually associated with their musical style. Successfully too, if I may say. The other thing I like most about them is that they seem to be so grounded, so humble despite their international success. They know well enough to stick to what works, mostly. But they're not one to be afraid to experiment a little. They're different but still the same. The irony here would be the different paradigm shifts. In the past, boy bands start as teenagers and then fizzle out in their 20's. For them it's quite the opposite and I guess it works well because they have a wider ocean of songs to cover and it just clicks with their age. Also, and this is just my personal insight, their success as a rebel/underdog YouTube band is like a major clapback to the music industry in general. My goodness, they have done it! Now it's weird but also good that they are in the mainstream. That's one of the "different but still the same" I was talking about earlier. Oh, and I do hope you can get your wish of performing for a smaller audience. Many artists dream about that but what can we do, economies of scale. But wouldn't it be nice?? Them performing with just a handful (say 50) people around, similar set-up to what you see on their YouTube videos? I'd take it! BOYCE AVENUE WITH MOIRA is organized and presented by WILBROS LIVE.